No, you haven’t misread this, I did indeed make sausage pies but fear not, I’ve not started eating meat. The sausages were of the veggie kind (Couldron brand to be precise). I had found this recipe on BBC Good Food about 18months ago and it has taken me this long to make it. And I really wish I hadn’t waited so long! It is very easy – cook some chopped onion, add sliced veggie sausage, then the halved mushrooms and cook these before adding creme fraiche (I went for full fat but recipe says half fat), wholegrain mustard (didn’t have any so used Dijon and I still think was OK) before putting in pie dishes and topping with torn ciabatta. I added some grated cheese on top and also some frozen peas to the mix. Absolutely delicious! This will go in my permanent recipe collection! 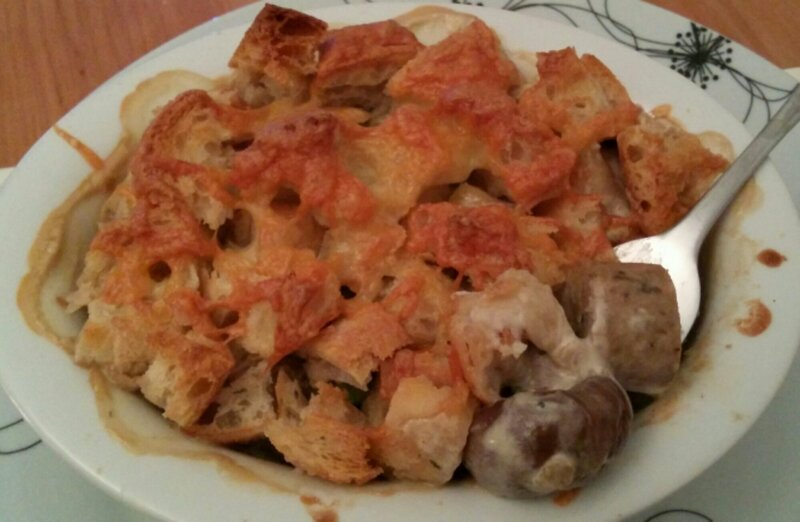 This entry was posted in Main dish, Vegetarian and tagged bread, GoodFood, mushrooms, peas, pie, sausages. Bookmark the permalink.